A wall lizard may look like another well camouflaged reptile but in reality this species presents a stunning set of well distinct morphs that differ in the coloration of their throat and bellies. Credits: Guillem Pérez i de Lanuza and Javier Ábalos. How are reptiles capable of generating such a diversity of bright colours? And how is it possible that within a single population of the same species, different individuals exhibit strikingly different coloration patterns? In a new paper published in the journal PNAS an international team of scientists, led by researchers from CIBIO/InBIO (University of Porto) and Uppsala University, reveal two genes implicated in yellow to red pigmentation in reptiles, and demonstrate that these “pigmentation genes” also affect behaviour and other traits. “While for a casual observer it may seem like an ordinary lizard, with its camouflaged back blending perfectly with rocky surroundings, in most populations of this species the belly and throat show a remarkable diversity in colour, being either white, bright orange/red or bright yellow. 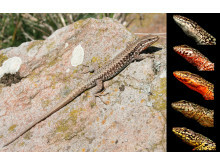 Strikingly, lizards of different colours differ in other characteristics, such as size, fighting ability and reproductive strategies. They also preferentially mate with individuals of their own colour,” said Pedro Andrade, PhD student at the University of Porto and lead author of the paper. The researchers found that the genomes of differently coloured lizards are virtually identical – except for very specific portions of the DNA sequence. “In nature, when individuals from different populations or species differ in multiple characteristics, the expectation is that many genes are involved. So, for us it was a big surprise to see that in these lizards, the colour differences and associated characteristics are largely explained by small regions of the genome that contain only two genes,” said senior author Miguel Carneiro from CIBIO, University of Porto. The gene SPR is of particular interest. The metabolic byproducts of this gene's activity are closely linked to the production of neurotransmitters like serotonin and dopamine. These are chemicals that, also in humans, are responsible for the transmission of information between neurons. 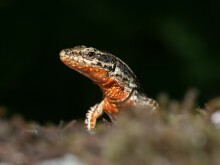 “Our results implicate that these “pigmentation genes” lead to other “side-effects”, such as potential differences in the functioning of the brain that could explain why lizards of different colour behave differently or have slightly different habitat choices,” said Professor Leif Andersson from Uppsala University, another senior author of the paper. The team also found that the DNA sequences associated with different colours were extremely divergent. The divergence in DNA sequence was big enough to go beyond what one would expect to find between species. The differences were up to six times larger than what is normally found when comparing human and chimpanzee DNA. 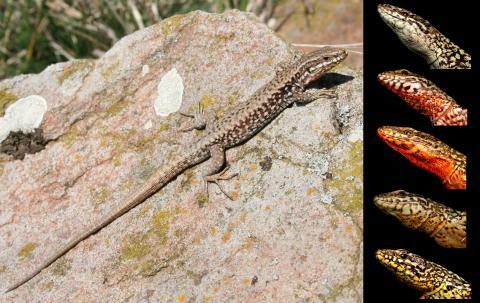 Further DNA analyzes showed that this genetic variation is shared with multiple lizard species that occur in the Mediterranean. The likely explanation for this pattern is that the DNA sequences associated with colouration are millions of years old and that some species have been exchanging them through natural hybridization. This highlights how hybridization is an important mechanism for the fast acquisition of new characteristics – even humans are an example of this, as shown by multiple evidence of hybridization between modern and archaic humans like Neanderthals. This international team of researchers has an ongoing research program focused on how colour variation and associated characteristics arise and are maintained. Ongoing work leverages techniques and expertise in the fields of genome sciences, animal behavior, and neurobiology and aims to help decipher other interesting aspects of the biology of the colour variation and what exactly the different colors are signaling to lizards, which is something that remains a mystery.